Favourites Vani Kapoor and Gurbani Singh scored big wins as the Usha All-India Ladies Amateur golf championships moved into the match play segment at the Chandigarh Golf Club here on Thursday. Are Rohit, Virat ready to take over? In another blow to the already tarnished image of athletics in the country, the NADA appointed panel suspended five athletes for being found guilty of doping. The decision comes as a shocker for these athletes and also for the others, as over a score of such cases are still under trial. The Indian team management quelled concerns over Ishant Sharma's fitness after the pacer walked off bowling just 5.3 overs on the opening day of their first practice match against Cricket Australia Chairman's XI here today. Punjab clinched a crucial 76-run first-innings lead to take command of their Elite group Ranji Trophy match against Karnataka at the M Chinnaswamy stadium here today. Having made 357 in the first innings, Punjab bowled out Karnataka for a modest 281. South African fast bowler Vernon Philander struck twice as Sri Lanka struggled on the first day of the first Test at SuperSport Park on Thursday. European champions Barcelona overpowered Qatar's Al Sadd 4-0 on Thursday to reach the Club World Cup final, Brazilian defender Adriano scoring twice in an embarrassingly one-sided contest. 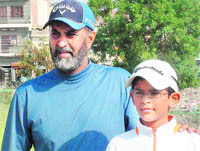 Ten-year-old city golfer Aadil Bedi has now realised his dream of topping the Indian Golf Union’s rankings in category-D (under 11 years) but his march to the pinnacle has not been easy. A student of Vivek High School, Aadil put in lot of hard work at the CGA Range here with his coach Jessie Grewal and won three major touraments during the last month to reach the top in his age category. India's ace shuttler Saina Nehwal stormed into the elimination round of the BWF Super Series Finals with a straight-game victory over Sayaka Sato of Japan in the women's singles in Liuzhou, China today. Indian bowling failed to make much of an impression as Cricket Australia Chairman's XI dominated the opening day of their two-day practice match, declaring their first innings at 398/6 at the Manuka Oval on Thursday. Regular skipper Mahendra Singh Dhoni opted against playing the match and Rahul Dravid took over the captaincy in his absence. Electing to field after winning the toss, the Indians started off strongly but the CAC XI wriggled out of the tight situation through contrasting centuries by opener Wes Robinson (143) and Tom Cooper (182 not out) to blunt the visiting attack. Even though the Indians struck back in the final hour, the CAC XI had all but exposed the weaknesses of an Indian attack when it takes the field without the experience of Zaheer Khan. Young pacer Umesh Yadav was the first to strike when he had CAC XI skipper Ryan Broad (8) caught behind by Wriddhimaan in the 10th over. 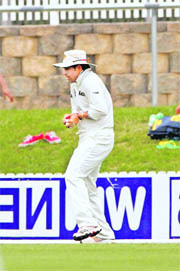 Umesh, in fact, managed to create an impression by scalping three wickets in miserly 15 overs conceding just 39 runs. Next man in Joe Burns (21) didn't last long either as Pragyan Ojha, who bowled 25 of the day's 86 overs, rattled his stumps. CAC XI looked in trouble at lunch with the scoreboard reading 53/2 but Robinson and Cooper started a slow recovery, building 226-run partnership for the third wicket. The two batsmen frustrated the Indian attack, which was hampered further when pacer Ishant Sharma walked off the field after completing just 5.3 overs. It was not clear just why Ishant was taken off the field. Abhimanyu Mithun could not grab a single wicket although he was economical, giving away 40 runs in his 12 overs. R Vinay Kumar, who was drafted into the squad after Varun Aaron was ousted due to injury, was a major disappointment going for 89 runs in his 17 overs although he managed to get a wicket. With the Indian bowlers going wicket-less in the second session, Robinson and Cooper steered CAC XI to 186/2 at tea and both the batsmen were close to their respective hundreds at that time. Post-tea, it didn't take long for them to reach the milestone and strengthen CAC XI's position with their contrasting innings. While Robinson played a patient knock that came off 215 deliveries, Cooper was more attacking and scored at almost run-a-ball during his 192-ball knock. Fall of wickets: 1-14, 2-45, 3-271, 4-363, 5-363, 6-398. Bowling: Ishant 5.3-3-7-0, Yadav 15-3-39-3, Mithun 12-1-40-0, Vinay 17-1-89-1, Ojha 25.3-5-149-2, Kohli 3-0-10-0, Rohit 8-0-56-0. Both Gurbani, the 2009 champion, and Vani, the current leader on the IGU’s Ladies Order of Merit, were five up with four holes to go and won with a lot to spare. There were no major surprises in the last 16 stage as Gurbani Singh made short work of Sehar Atwal 5&4 and Vani eliminated Sukhneer Saini by the same margin. Vani played some excellent golf as did Gurbani, but their opponents were also overawed by the occasion. Amandeep Drall, the surprise winner in the strokeplay section of the championships moved ahead in the championship by beating Nanki Chadha, who came through the play-off. Drall won 3&2. Drall now runs into Aditi Ashok, a semi-finalist last year. The 13-year-old Aditi, winner of an event against professionals recently, emerged a comfortable 4&2 winner over Anisha Padukone in a fairly one-sided match. Raksha Phadke was another big winner by a 4&3 margin over Astha Madan and Phadke now clashes with the top favourite Vani Kapoor in the quarterfinal. Millie Saroha beat Rabiya Gill in a close finish 2&1 and will meet Gurbani Singh. In the only match to go into extra holes, Tvesa Malik gave Gursimar Badwal a tough fight before Gursimar won on the 19th hole. She will now meet Ankita Kedlaya, who beat Nikita Arjun 2&1. The quarterfinals will be played on Friday and the semifinals on Saturday and the final will be on Sunday. Results of the Round of 16: Amandeep Drall beat Nanki Chadha 3&2, Aditi Ashok beat Anisha Padukone 4&2, Gurbani Singh beat Sehar Atwal 5&4, Millie Saroha beat Rabiya Gill 2&1, Vani Kapoor beat Sukhneer Saini 5&4, Raksha Phadke beat Astha Madan 4&3, Gursimar Badwal beat Tvesa Malik 19th hole, Ankita Kedlaya beat Nikita Arjun 2&1. The quarter-final line-up is as follows: Amandeep Drall v/s Aditi Ashok; Gurbani Singh v/s Millie Saroha; Vani Kapoor v/s Raksha Phadke; Gursimar Badwal v/s Ankita Kedlaya. Prominent among the suspended athletes include former university champion Hemant Kirulkar, suspended for two years. The National Anti-Doping Disciplinary panel, headed by Sudhir Nand Rajog, suspended four other athletes - woman javelin thrower Megha Pardeshi of Maharashtra, distance runner B. Madhusudhan of the CRPF, hammer thrower Gaurav Bhardwaj of Uttar Pradesh, and shot putter Budhisatva Banerjee of MP - for two years. Kirulkar, who won the 100m title in the all-India inter-University championships in Chennai in 2009 with a personal best 10.57 seconds, was found positive for steroid oxandrolone in an out-of-competition test conducted last April. The Armyman from Maharashtra was suspended for two years from the date of his provisional suspension, on May 23, 2011. Kirulkar had come third in the National inter-State meet at Patiala with 10.58 seconds and was a silver medallist at the South Asian junior athletics championships in 2007. Megha Pardeshi tested positive for steroid stanozolol in the second leg of the Indian Grand Prix at Patiala on May 7 this year. Nineteen-year old Gaurav Bhardwaj tested positive for steroid nandrolone and stimulant mephentermene in a test conducted at the National Youth Championships in Ranchi last May. Madhusudhan tested positive for steroid stanozolol and corticosteroid prednisolone at the All India Police Cross-Country Championships last May. Banerjee returned positive for metabolites of hormone antagonist tamoxifen, and stimulant methylhexaneamine at the National inter-State meet in Bangalore last June. NADA chief Rahul Bhatnagar said the suspended athletes would get a chance to prove their point in the NADA Appeals Panel. Sharma sent scare through the Indian camp when he left the field without completing his sixth over about half an hour before lunch at the Manuka Oval here. Team officials, however, insisted that Sharma merely needed to remove some strapping from his ankle that had loosened and become uncomfortable. They further added that since Sharma was slated to bowl only six overs in this match, there was little point strapping him up again for the remaining three balls. The team's media manager said there was no injury while another member from the support staff said that the interruption had more to do with team's hectic last 24 hours. Batting a second time round, the visitors, who lost three wickets for 37 runs in under ten overs, finished Day Three at 119 for three. In effect, they are 195 runs ahead. If they bat until lunch, they should be rest assured of collecting three points from this game. Mayank Sidhana, who made a gutsy 92 in the first innings, was unbeaten with 57, and giving the promising middle-order company was Uday Kaul with 23 runs to his credit. Resuming at overnight 183 for five, Karnataka were kept in good stead by Stuart Binny (119) and C M Gautam. The duo seemed determined to steer their side to the vital lead. But Rajwinder Singh produced the breakthrough, trapping Gautam right in front. Gautam contributed 62 to the sixth-wicket partnership of 128. JAIPUR: A five-wicket haul by medium pacer Pankaj Singh (5 for 64) and a brisk unbeaten half-century by Akash Chopra (87) took Rajasthan to a commanding position against Saurashtra in their Ranji Trophy Elite Group A match at the Sawai Man Singh stadium here today. Sri Lanka were 76 for three after being sent in on a green pitch that offered bounce and movement to the South African fast bowlers. The tourists lost their first two wickets for 12 runs before Tharanga Paranavitana (32) and Mahela Jayawardene (23 not out) put on 54 for the third wicket. Philander took two for 30, taking a wicket in both of his two spells. Sri Lankan captain Tillekeratne Dilshan played a poor shot in the fifth over to present Dale Steyn with his 250th Test wicket, driving at a ball that was slightly short of length and scooping a simple catch to mid-wicket. Steyn achieved the milestone in his 49th Test, one match more than Australia's Dennis Lillee, the fastest to reach the mark. 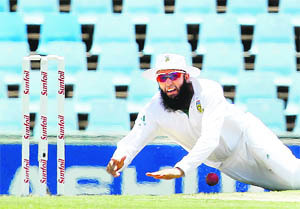 He moved ahead of Allan Donald, now the South African bowling coach, who took 50 matches to take 250 wickets. Three balls later, Kumar Sangakkara was out for one, caught by Jacques Kallis at second slip off a ball from Philander that lifted and seamed away from the left-hander. The left-handed Paranavitana and the experienced Jayawardene dug in, with Paranavitana showing character as he shrugged off a blow on the helmet from Morne Morkel and one on the shoulder from Philander. The Spanish champions face Brazil's Santos in a mouth-watering final in Yokohama on Sunday. The gloss was taken off an easy win in front of 66,000 spectators after Spain striker David Villa was rushed to hospital with a broken leg after going down awkwardly in the first half. Barca took the lead after 25 minutes, Pedro's cross bobbling off Al Sadd defender Nadir Belhadj and goalkeeper Mohamed Saqr's panicked clearance crashing off Adriano's shin into the back of the net. Adriano scored his second two minutes before halftime, latching on to a pass from Thiago Alcantara. His most recent win came in the Western India Junior Open Golf Championship at BPGC (Bombay Presidency Golf Club) that was held from November 29 to December 2. Before that win Aadil also notched up a win with a three-day score of 78, 80 and 82 in the Eastern India Junior Golf Championship held at Tollygunje Golf Club, Kolkata. It was a big win for Aadil there after he had finished runners-up seven times in Category D in the Indian Golf Union tournaments last year. “I was confident of winning the title but it was tough. All the fellow golfers in my category have been playing well. It was disappointing to lose the top spot seven times during last year and wins like these always help,” says Aadil. “Investing time at this age in golf is what makes youngsters like these so focused and talented. 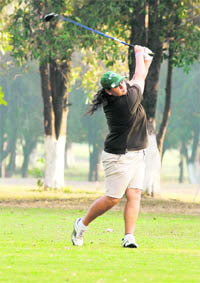 Aadil has got a schedule which is oriented towards golf and that is his main strength,” says coach Grewal. Aadil also has former golfer Irina Singh as his psychological coach. World number four Saina, who had defeated Korean Youn Joo Bae yesterday, beat Sayaka 21-16, 21-13 in a 36-minute match to keep her record 2-0 so far.